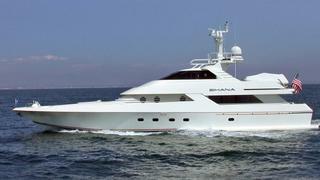 Bob Denison at Denison Yacht Sales tells me that the California office has now closed on the sale of the 32.61m motor yacht Shana, listed jointly by Ardell and Fraser Yachts. Shana was designed by the legendary Glade Johnson with naval architecture by Guido Perla, and custom built by Workboats Northwest in 1990. She featured in Volume 5 of The Superyachts and was also a recipient of the Superyachts Society Design Award for the best motor yacht over 23 meters. She can accommodate six guests in three staterooms and has a range of 3,000nm at 10 knots. Shana underwent an extensive refit at Knight & Carver's facility in San Diego in 2007, including a new paint job and several engineering upgrades. Her buyers plan to keep her on the West Coast to cruise up and down the California coast, along with the scenic waters of Mexico. Shana was asking $1.85 million.